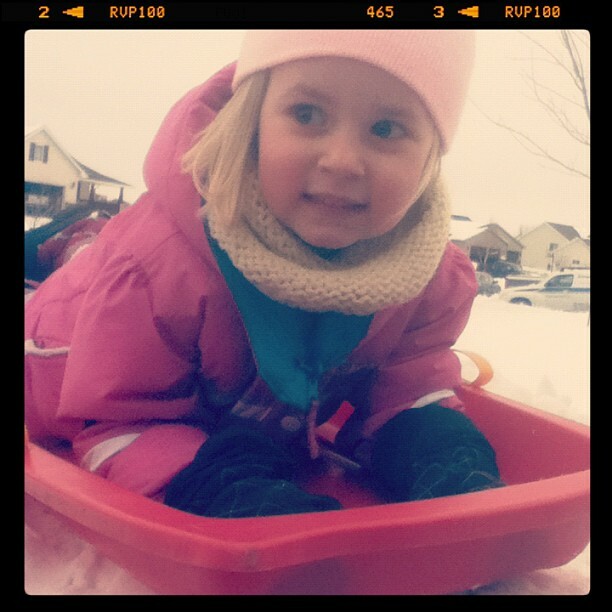 Proof my December baby actually might have had some fun in the cold and snow. You see, my December baby ain't too keen on bundling up and playing in the snow. She's a winter-hater (even though we don't say hate in our house) just like her Daddy. So here we were yesterday, roughly 1,545 days since becoming mother and daughter, playing in the snow together for the very first time. I love that I experienced another first in motherhood, as those occasions become less and less frequent. I tell you ... sledding in suburbia as a first was way more enjoyable than hearing her drop her first eff-bomb on THANKSGIVING DAY, 2011, courtesy of Mama saying it first.